Raise your hand if managing papers is a huge part of your day. I raise both hands, because my paper chase is a long journey! Whether it’s student work, assessments, papers to grade, centers to laminate, or RTI data for that upcoming IEP, managing papers is an enormous part of teacher life. Having systems for your paper trail is an ENORMOUS part of effective classroom management. I was a chronic piler who relied on sticky notes. Said sticky notes would get lost, and then the piles would melt together in sea of doom. Honestly, I would dump my piles in a top secret bin under my desk, chug coffee, and sort. It was a nightmare! Now, the sea of doom has vanished. Thanks to a little freebie I made here at the shop. 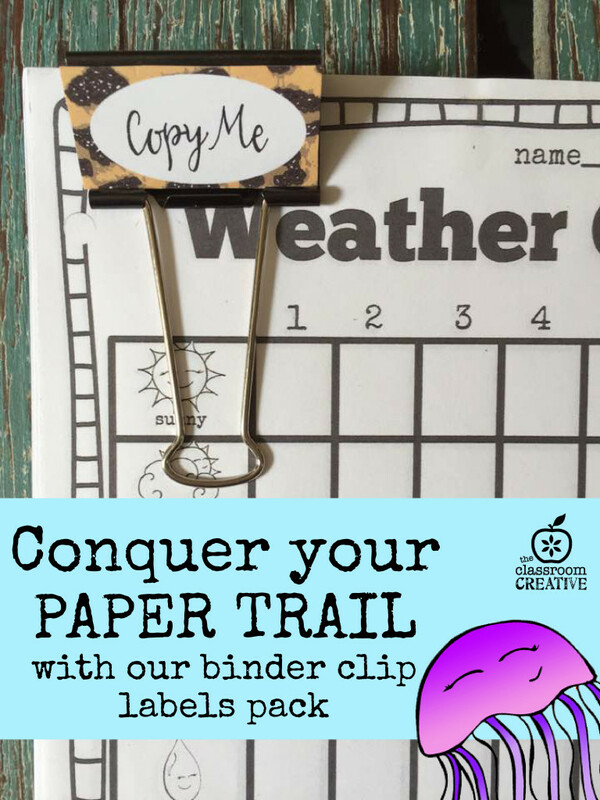 This little freebie I made here at The Classroom Creative changed my life. It’s been pinned close to 100,000 times- so I guess the masses agree- the paper trail needs to be blazed! 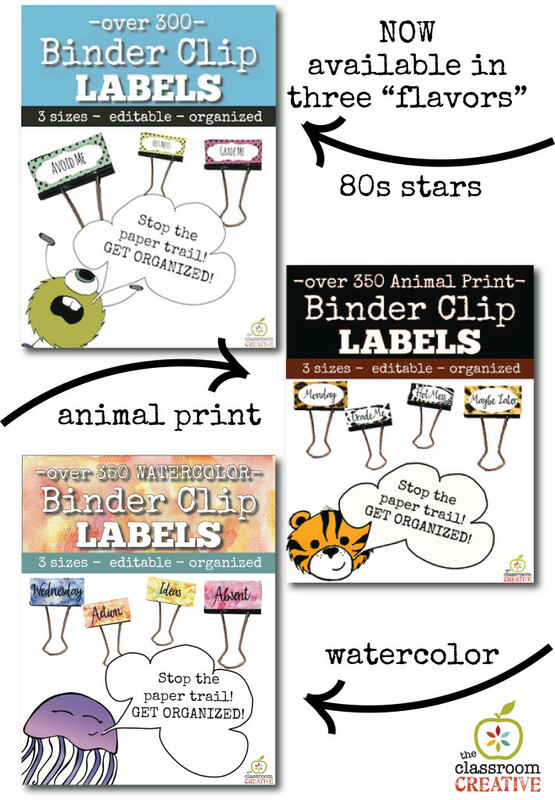 Now, we offer these binder clip packs in three “flavors” : 80s star print, animal print, and watercolor. These binder clip label packs turn those evil piles into smiles. Sometimes a little whimsy and fun design makes staying on top of your life much easier. Each of our packs have over 100 labels in 3 sizes, plus editable pages. Here’s a closer look at a few of our fun labels. I wrangle the stuff I need to memorialize in plastic. Let’s be honest: my laminator and I are on a first name basis. We spend a lot of quality time together. A pile for stuff to photocopy is always a staple in every teacher’s life. So, this binder clip works overtime. There are SOOOO many more fun labels, but we’ve even made many practical labels too like the alphabet, numbers, subjects, etc. Each pack has an editable power point component so you can make personalized ones for your students or any other ideas you can create. I highly recommend making one for SNACKS: STAY AWAY. 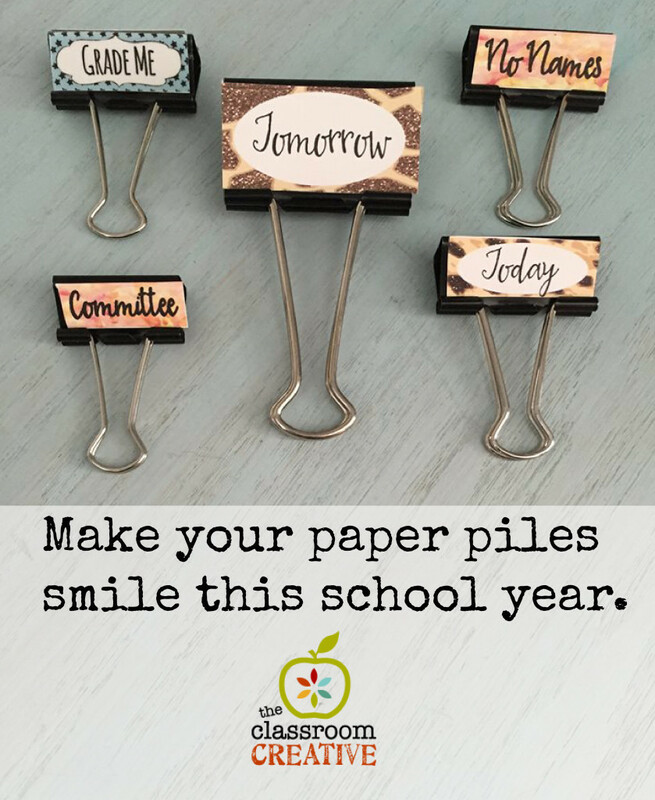 Put the editable labels with student names on their cubbies, mailboxes, or give them as student gifts. These binder clip packs were a labor of love. I know you will love them as much as I do. Managing papers is a necessary evil. These labels make the piles smile. For less than a cheap shirt at Target, you can have endless labels and grab some cheap binder clips at the dollar store. This system, along with adequate sleep and rest, an occasional coffee or glass of wine, will transform your school year. Seriously. There is a reason 100,000 people agree with this idea at Pinterest. That still blows my mind. 100,000 people? That’s a small town. It is genius. 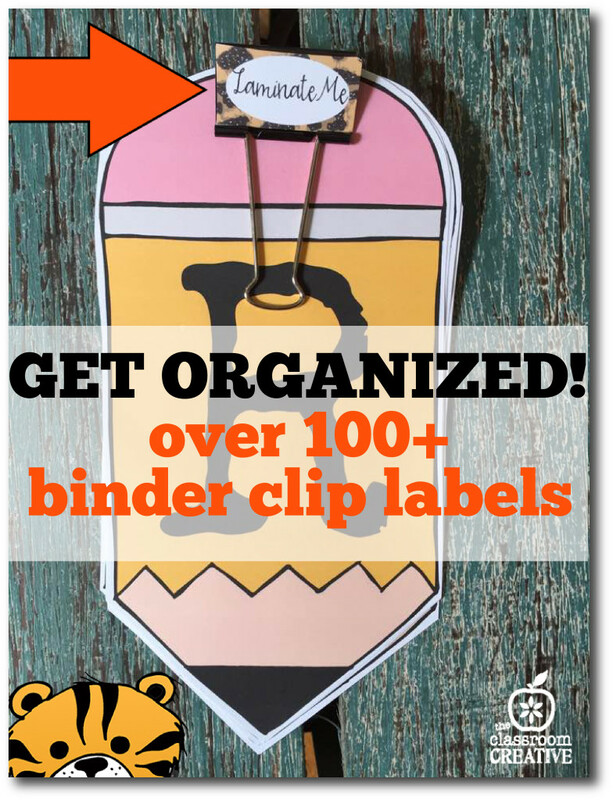 Download the freebie, make some fun binder clips, and get ORGANIZED!